Upside-Down Tomatoes are Smart for Small Garden Spaces! You are here: Home / GARDEN / Upside-Down Tomatoes — Grow Vertically to Save Space! Upside-Down Tomatoes — Grow Vertically to Save Space! You’ve seen those Topsy Turvy contraptions, right? 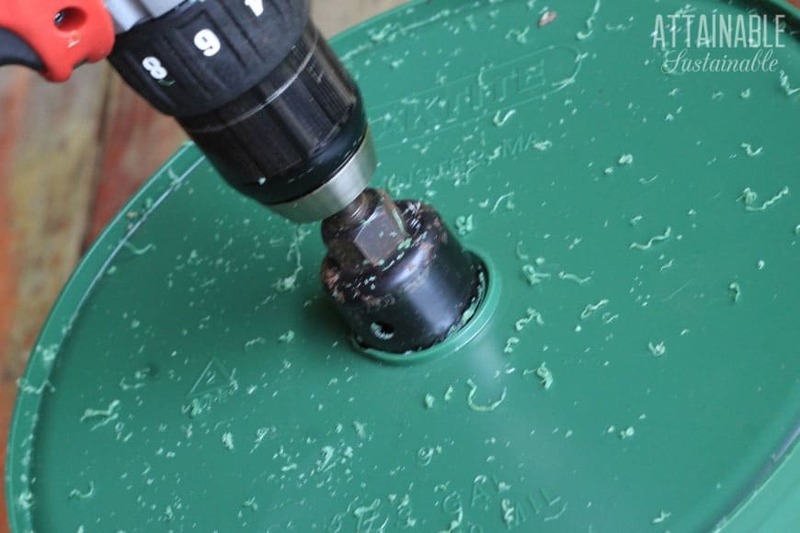 Here’s how you can make one of your own with a 5-gallon bucket. It will take you less than half an hour to put together, and growing upside-down tomatoes is a good way to get the most out of your space. 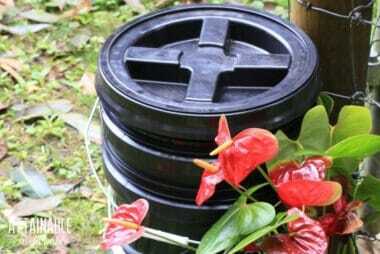 This upside-down tomato planter works well with both determinate and indeterminate tomato plants. A cherry tomato is a nice choice if you’ll be hanging this on a patio — perfect for summertime snacking! It also works well with a Roma tomato. This is really an easy project, though you’ll need one specialized piece of equipment to make it: A hole saw that attaches to a drill. If you’ve got a woodworker friend, maybe you can borrow one. 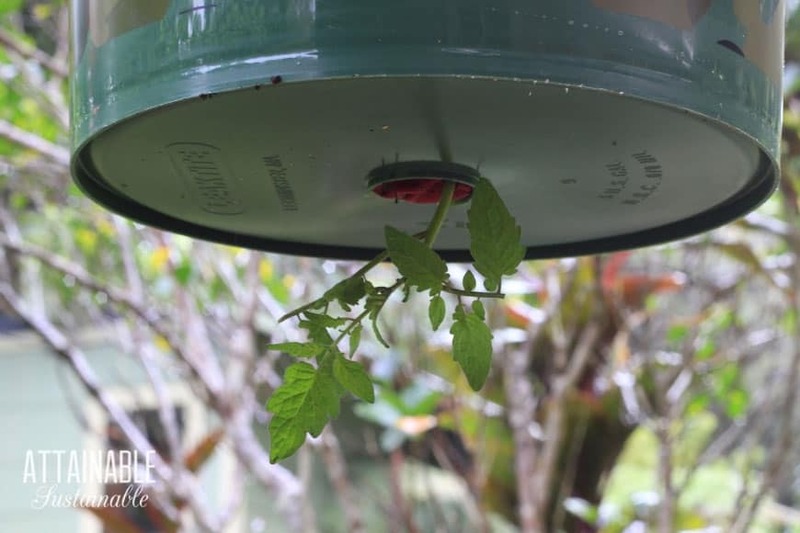 Much like growing tomatoes in containers on the ground, you’ll need to make sue that the soil in this hanging tomato planter remains moist (but not wet). Fertilize every couple of weeks with a diluted compost or manure tea. 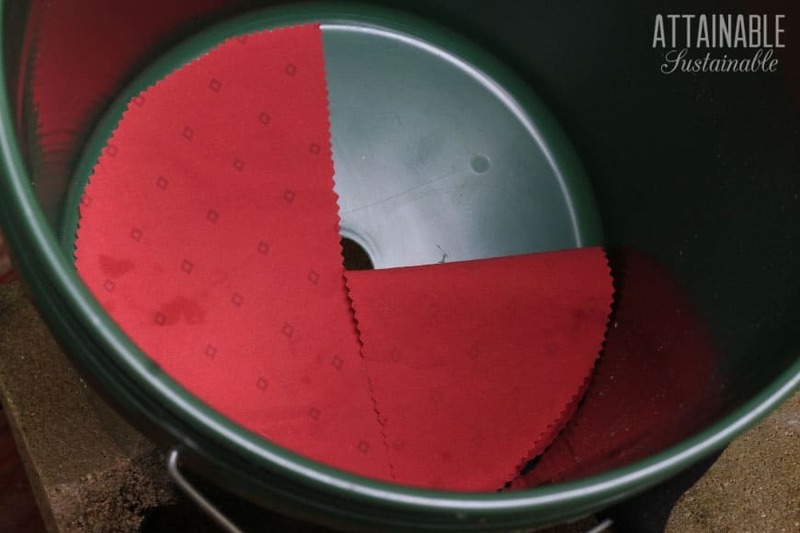 Step 2: Cut a piece of scrap fabric roughly the size of the base of the bucket. Step 3: Cut a slit to the center of the fabric. This will help hold the soil and tomato seedling in place until the tomato plant gets rooted in. Step 4: Set the bucket up on blocks of some sort. This will allow you to place the tomato seedling into the hanging planter without smashing it. 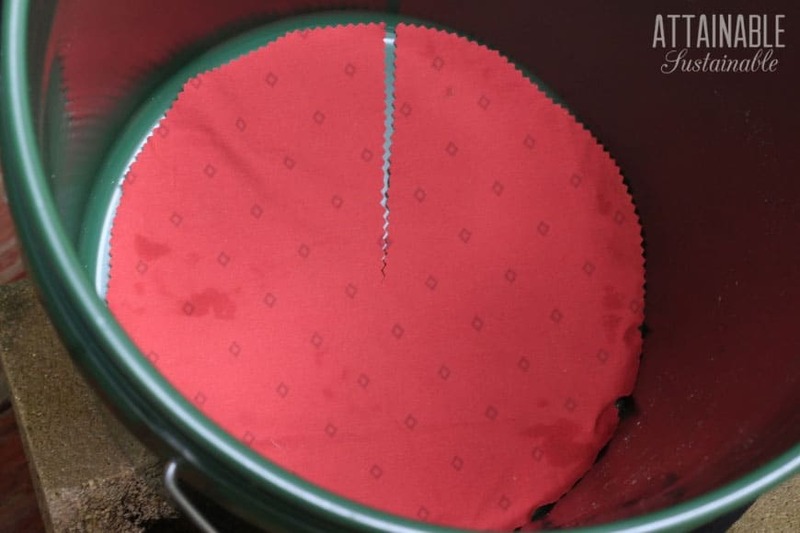 Step 5: Place the tomato seedling in the hole, with the greens hanging below the bucket. Pull the edges of the fabric slit together, snug around the stem. Step 6: Gently add soil around tomato roots and continue adding soil until the bucket is nearly full. Use a mixture of roughly two parts potting soil, two parts peat moss, and one part perlite for a lighter mix, since it will be hanging. 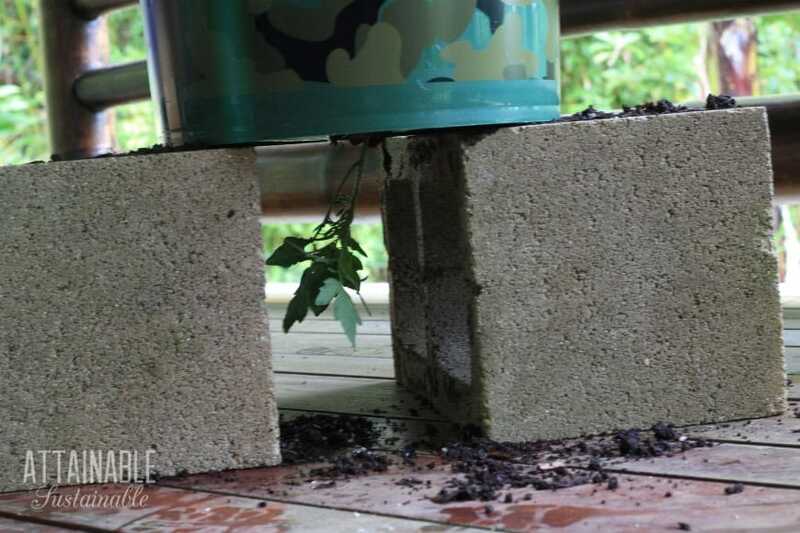 You don’t want the upside-down tomato planter to be so heavy that it breaks! Note: I’m updating photos for this post and growing more upside-down tomatoes under a new awning. The next photo you’ll see is from the first ones I made. I’ll be adding a new photo of my thriving upside-down tomato planter soon! Stay tuned. I like the idea of painting it too… looking forward to hearing more about this project. My father has been doing the Topsy Turvy in buckets for year now. 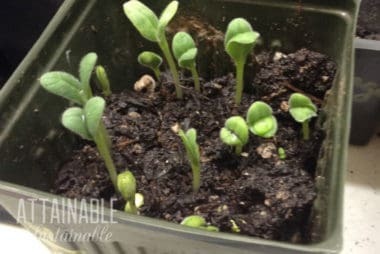 He used a styrofoam circle, with a slit cut in it, in the bottom of the bucket to help hold the tomatoe plants in and keep the soil from washing out. You dont want to use a foam that soaks up too much water or it can rot the plants off. Last year I also planted some with holes/plants in the side, seemed to work well and its nice not having to tie up the plants! This is great. A couple of years ago our gardening space was limited so we hung a similar version (osh buckets) along the patio wall…we did tomatoes and zucchinis… and drilled a hole in the top and a hole on each side…it actually worked out really well…I’ll post a picture if I can find one…! Fun! I have two cloth-in-a-wire-frame hangars from Gardener’s Supply and I’ve used them over and over again. Hopefully you have enough soil in the bucket to handle the lack of moisture compared to right-side-up planters and just using the ground. You will need to keep an eagle eye on the moisture — as you know, tomatoes require a LOT of water during fruiting. I was very successful with them in NebrasAlso, those in colder climates can consider painting their buckets flat black to keep them warmer. Yes, dark colors will indeed make a difference. There’s even this particular shade of red that a university (Cornell, I think?) determined is of the proper wavelength to help out tomato (and related plant) growth. @vollmerdp Good to know you were successful with them! I dislike growing in containers because keeping them moist can be so difficult, but we’re so limited on growing space, I figure it’s worth a try. We’ve got pretty high humidity, so maybe that will make it slightly less forgiving?? You are brilliant! My kid has been wanting me to get a topsy turvy, mostly because she likes to buy things off TV. The pro for me is that I need to keep plants close to the house to dissuade deer from doing them in. I CAN’T WAIT TO TRY THIS. Great idea! I haven’t bought one of these but have always wanted to try it! Clever idea! Although it’s too cold here right now, I look forward to being able to grow some nice juicy tomatoes when the warm weather returns. Keep us posted on your success! I can’t wait for you to try it, either! This was really interesting to see how you put it all together! These always look so cute – and practical. Thanks for the primer. I might have to try this come spring. Great how-to post. 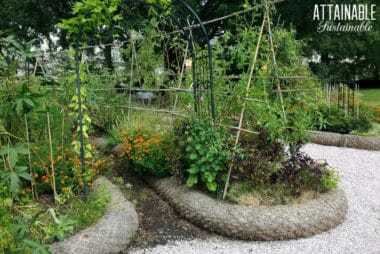 My sister did this last summer and her “upside down” tomatoes outproduced her others by quite a lot! I’m determined to try it myself, although I haven’t figured out a good place to do it yet. Thanks for the inspiration! I want to try this too. It’s too cold here right now for tomatoes but I’d love grow fresh tomatoes this summer. We have problems with our growing space as well. 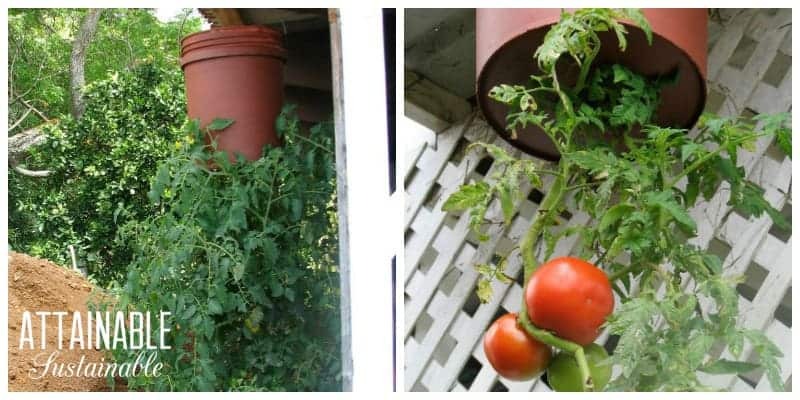 I’ve made my own upside down tomato pots for the past two years and they’ve done better than the ones on in the deck pots! Brilliant!! I also have wanted to do the TV version, but refused to dish out that much $$ for something I’m sure cost $3.00 at best to create..I knew there had to be a DIY version….YOU ARE GENIUS and provided great instructions. Thank you in advance. Erika, I’m the queen of figuring out how to do something with what I have on hand! LOL It doesn’t *always turn out, but sometimes it does. I’m glad you think this will work for you! My back porch is facing a busy highway that has a redlight not far from where I live. I get noxious gas fumes on a daily basis. My question is…is it SAFE to eat the tomatoes that will be exposed to gas and diesel engines exhausts? Thank you. This is so cool! I just moved into my own home, and I am so excited to grow veggies! When you fertilize them, are you spraying an organic topical? Or fertilizing the roots in the bucket? what are you fertilizing with and how often? I like to use compost at the soil level and foliar kelp spray.